Wow, I have to track these down that sounds like a great story. I really need to get into 2000AD, I love anthologies and I love weird stories so it should be right up my alley. Mate there is so much cool stuff for you to find, but it may be best for you to try some of their collections, as opposed to a run of issues. Look into the 2000AD app if you're into digital, there are a lot of collections there as well as the single issues. Probably a lot easier than buying print books in the States too. Good call, thanks for the advice man. Yeah, I've had pretty limited success finding old 2000 AD issues for a reasonable price, too. One of my close runner-ups was also a character from Haunt of Horrors. 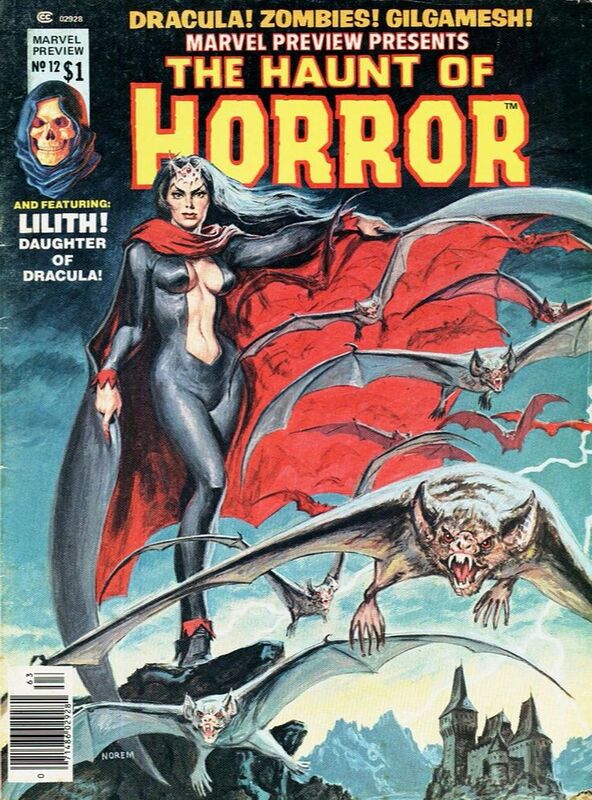 Lilith was definitely intriguing too. I was introduced to this series indirectly, in The Comic Book Book, a paperback collecting essays on old comics (the sequel to All In Color For A Dime). Frankenstein aficionado Don Glut made this sound like one of the coolest things ever, and when I finally got the opportunity to read it, I wasn't disappointed! 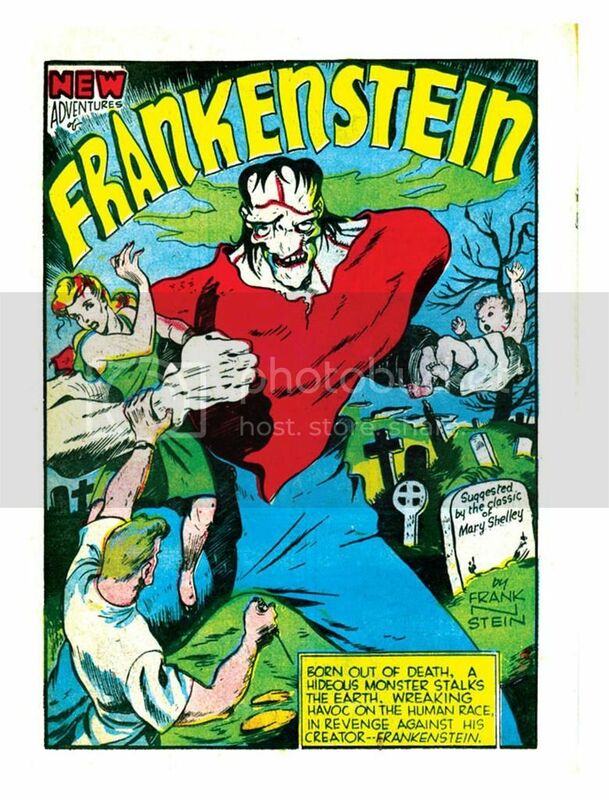 Briefer's Frankenstein was initially a literal giant, an evil creation that cribbed much of the classic Universal version, but was ultimately distinctly its own thing. Briefer's monster was a rampaging, bloodthirsty menace, pushing the boundaries of good taste, but loads of crude fun. The early run ("The New Adventures of Frankenstein") had an ongoing continuity linking its installments, leading eventually to a rehabilitation at the hands of the military, who neatened his appearance and put him to work as "Mr. Frankenstein", and the series quickly mutated into a humor strip! 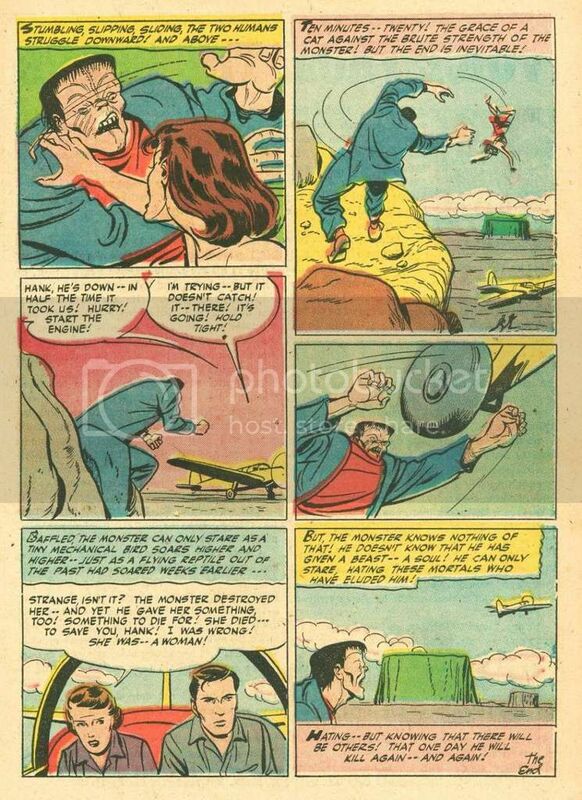 But after a few years in his own comic, operating as a mild-mannered funny character, Briefer pulled another turn-around. 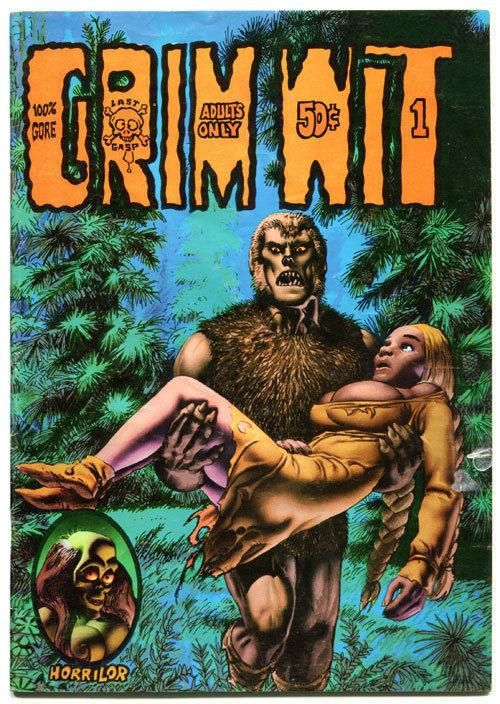 In 1952, after the comic had been dormant for 3 years, he revived it again as an all-out horror comic. What followed in the 16 issues was a roller coaster ride of imaginative horror, with dinosaurs, mummies, brides, murderers, all the unleashed terrors you could fit into a 50's horror comic! Absolutely astounding stuff, always highly readable and enjoyable. I love how the cover is signed "Frank N. Stein"
I've read a few issues from the humor stretch. It really was quite funny. 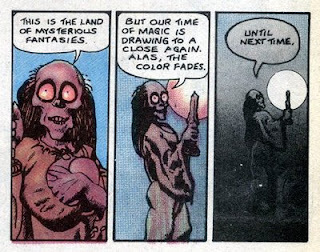 For the first week, I'm going with Horrilor, the hostess of Richard Corben's Grim Wit. That's her in the lower left. She has the same dry humor as most hosts, but her appearance, and the style of her intro/outro pages, meshes very well with the tone of Corben's stories. Not sure I'll get a list together in time to participate but some great choices so far. Who's the artist on those Flesh pages? They look really good. Ulysses Bloodstone was an excellent character concept and I always enjoyed his stories whenever I came across one somewhere. I haven't read any comics featuring his daughter Elsa, but my impression is that Marvel has made the same mistake they've made with most of their non-superhero-genre characters by moving her and the Lovecraftian Bloodstone world into their all-encompassing superhero-universe. I enjoyed the initial 4 issue mini series featuring Elsa by Dan Abnett, but it came after Stern used Ulysses in a story featuring Dr. Druid, Wakanda, The Mole Man and Fin Fan Foom in the Marvel Universe anthology series and while it was a great story, it did set Ulysses firmly within the MU as a whole. Elsa was then features in Nextwave by Warren Ellis and another Bloodstone offsrping (a son I think) was part of the Marvel Now Avengers Arena title, but I didn't read it. Bloodstone was then part of the team featured in the Avengers 1959 mini by Howard Chaykin I believe, which again was a good story on its own but again used Bloodstone as part of the bigger MU in the past, as Stern had done in Marvel Universe. But it all started with Mark Gruenwald using the Bloodstone legacy for a stry arc when Cap went bi-weekly for the summer in the late 80s in the Bloodstone Hunt arc, which is where it was established that Ulysses was part of the larger MU. So your instinct is correct that the Bloodstone mythos was moved into the MU, but it was done with Ulysses, not Elsa. In fact her initial mini was more apart from the main MU in feel than any of the the appearances of Ulysses since the 80s. After that mini, not so much though. I might have a look at that first miniseries then, depending on how the artwork looks. Not to speak ill of the dead (especially in Hallowe'en month!) it doesn't surprise me that Mark Gruenwald was involved, as his name seems to come up with other character developments I don't like the sound of. Luckily for me they mostly took place after I stopped reading Marvel, so I didn't hear about them until years afterwards.